May 2-5 in Houston, Texas. Over 100,000 of the most important and influential individuals in the worldwide marine/ offshore industry are expected to attend the Offshore Technology Conference this year. OTC attendance in Houston is expected to be greater than ever. OTC is a maximum-interest event. MR's April 1st SPECIAL ISSUE will generate maximum reader interest . . . with an editorial environment sure to bring out the full sales-building potential of your advertising message. This is a true preview issue. It will deliver the full OTC story . . . and your advertising . . . to MR's unequalled audience of marine/offshore buying-influence readers . . . thousands more than any other marine magazine ... in their offices weeks before these buyers attend the conference. Whether or not you plan to attend or exhibit... you can "be there" ... at OTC with your advertising working for you in the April 1st Special Issue of Maritime Reporter. 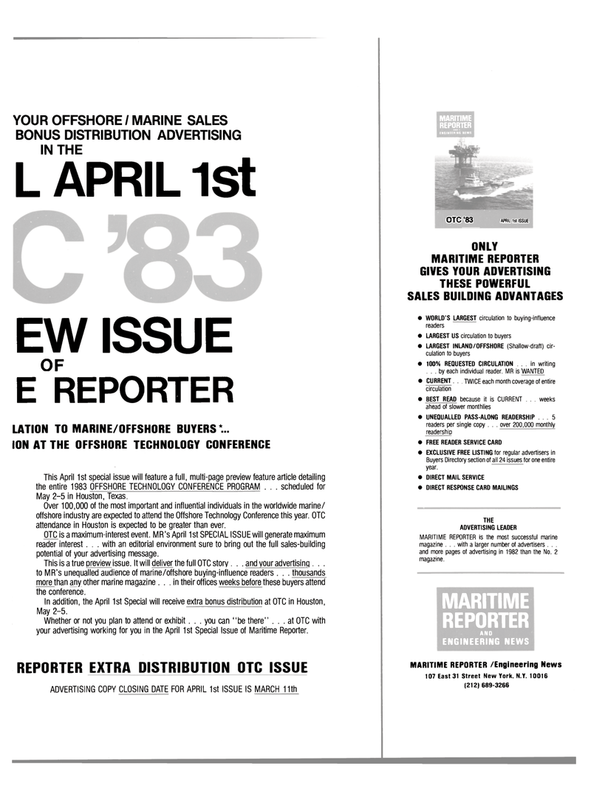 MARITIME REPORTER is the most successful marine magazine . . . with a larger number of advertisers . . . and more pages of advertising in 1982 than the No. 2 magazine.